Nave, Virtual instrument for iPhone / iPod Touch / iPad from Waldorf. 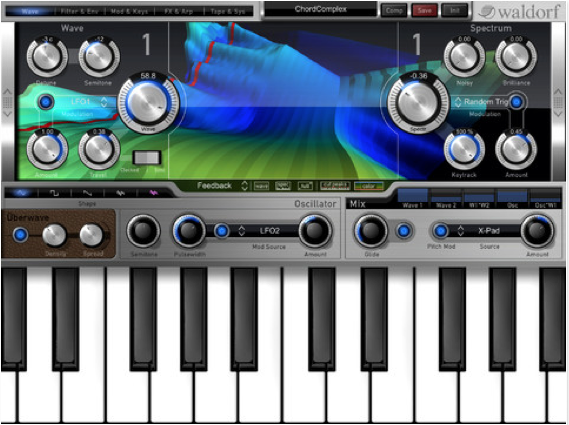 For Xmas, Waldorf lowers the price of its Nave synth app and offers decreasing discounts on its software catalog. The Nave virtual synth for iPad has been elected by Apple one of the best apps of the year and to celebrate this success, Waldorf lowers the price of the synth to 10.99€ instead of 17.90€ until December 27th on the AppStore. Plus, you can currently get Waldorf’s sound libraries, effects and soft synths at discounted prices on the online store. The promotion is gradually decreasing, with 25% discount on December 23rd, 24th and 25th with coupon code XMAS25, and then 20% with code XMAS20 on December 26th and 27th. More info at www.waldorfmusic-shop.de. Liquid Notes becomes a DAW. Almost. The powerful songwriting assistant software now features a piano roll, providing information on a single-note level. Just like a DAW does. 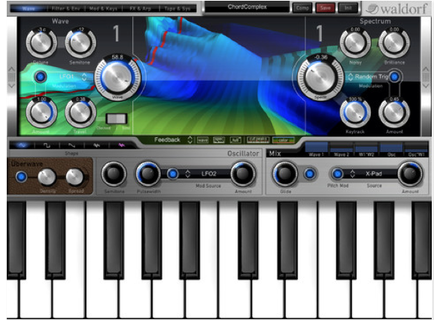 Friday’s Freeware: Thank you B Serrano This week, we thank a member of the community who decided to offer you one of its virtual synth, an Audiofanzine exclusivity. What’s the mood of your songs? This is the question Eventide is trying to answer with Mood, a new plug-in designed for analyzing the emotional part of music.